FilRight Pro PLA+ filament is stronger than FilRight Maker PLA filament and specially developed for professional use. The adhesion to the print bed is excellent (tested at room temperature) and the shrinkage is very low. Because of this - and because of the small diameter tolerance - FilRight Pro PLA+ filament can be printed on almost every brand and model (FDM) 3D printer. Why 3D printing with PLA filament? Because PLA filament is easy to print, the popularity of this 3D printing material keeps increasing rapidly. PLA (Poly Lactic Acid) filament is also called the green plastic. This biopolymer is made from corn starch, is biodegradable and non-toxic. In addition to the benefits for the environment, it also has positive effects on the printing environment. No unpleasant odors are released during printing with PLA+ filament. The space in which the 3D printer is located will even smell slightly sweet. FilRight Pro PLA+ filament is delivered on a sealed 2300 gram spool, packed in a cardboard box so that the filament is not damaged during transport. 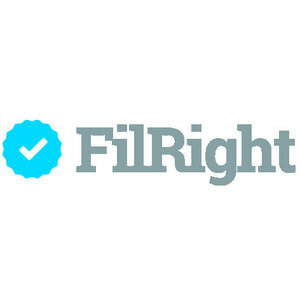 FilRight Pro PLA+ filament is available in many different colors and in both 1.75 and 2.85 mm diameters. Colors and spool sizes that are not shown on our website are often available on request. To achieve the best results, printing with FilRight Pro PLA+ filament, we recommend setting the 3D print temperature between 180°C and 220°C. A heatbed is not required when printing with PLA+ filament, but it is recommended. If you use a heatbed, we advise you to set the temperature between 35°C and 60°C. An MSDS and a TDS are available with specifications related to PLA+ filament. Want to know more about FilRight Pro PLA+ filament? Then contact us.